Andaman is a group of 325 islands while the Nicobar has 24 islands situated in the midst of nowhere. It is an isolated archipelago and needs robust system of connectivity. Andaman has an international airport, Veer Savarkar International; Airport at Port Blair that caters to all in-bound and out-bound tourists flying to and from the islands to and from the rest of the world. By Air – The flight time from the Indian subcontinent mainland would around 2 hours to Port Blair. Port Blair is connected to Chennai, Kolkata, New Delhi, Bhubaneshwar and Vishakhapatnam by air. By Sea – Andaman is connected to the major port cities of Kolkata, Chennai and Vishakhapatnam/Vizag via water way. There are ships leaving on a regular basis from all these three cities and connect Port Blair at the Haddo Wharf. It takes around 3-4 days to reach Port Blair by sea from the ports of Chennai, Kolkata or Vishakhapatnam. 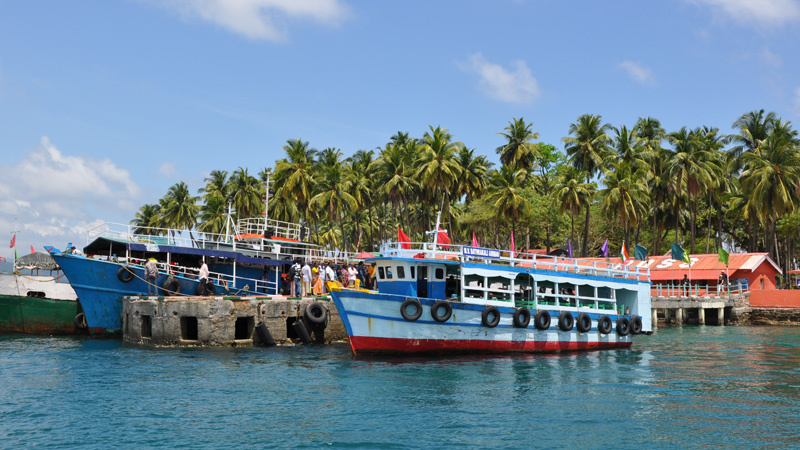 The main ships connecting the three ports to Port Blair are MV Nancowry, MV Nicobar, MV Harshavardhana, M.V. Swaraj Dweep and M.V. Akbar. Interested passengers can book tickets in advance at the ticket reservation counters (STARS Ticketing Counters) for the scheduled sailings from Vizag, Kolkata and Chennai.